Our transmission package is complete with all parts to install a manual transmission behind Small Block Ford V8 engines. 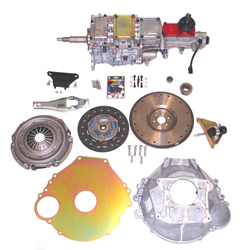 This package assumes the customer has a standard or mild performance 1984 or later style small block 302 (with one piece rear seal and 50oz unbalance). The cast flywheel supplied in this package is external balance 157 teeth (check that your starter motor will accept this). Earlier 302 (28 oz unbalance) together with 351W and 351C can be accommodated at additional cost. The package includes a billet slave cylinder for use with most ¾” bore slave cylinders. The clutch fork will also accept cable operation.